It’s finally October! Which means it’s sweater weather, and nothing compliments sweater weather like a good read. First and foremost, I’d like to welcome you all to the first blog post that’s kicking off The Young Folks’ very first Booktober book series! My goal is to get all of you readers in the Halloween bookish spirit through a variety of spooky literature. During the month of Booktober, you can expect a weekly dose of book reviews with a dash of giveaways and author interviews. Keep your eyes peeled on The Young Folks website for all of the ghoulish fun. 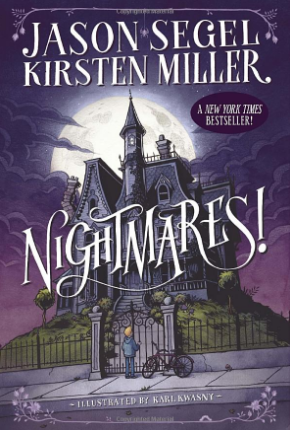 To kick off the series, I decided to review Jason’s Segel debut book, titled Nightmares! Warning: There’s spooky spoilers up ahead. You’ve been warned. In 2014, I attended Jason Segel’s book event for Nightmares! in San Francisco. The rumors of him doing a trilogy have been circulating since 2013. From a stunning cover, interesting synopsis and of course, having it be co-written by Jason Segel, you can’t help but have high hopes. In short, Nightmares! was a tough book for me to get through. It didn’t have as much substance as I initially thought it was going to have. Though it had a really good message about facing your fears, the book could have definitely been executed a little differently. Nightmares! revolves around a boy named Charlie who’s been having a hard time sleeping. From his vivid nightmares to dealing with the death of his mom, he doesn’t remember the last time he got a full night’s rest. There is one thing that’s especially keeping him up at night and that’s his new step-mom, who is a witch. Jason Segel takes readers, both young and the young at heart, on an epic adventure that makes us all face our fears. As I was reading Nightmares!, I was having a hard time connecting to Charlie. I understood the reasons why he was angry and sad and depressed yet there were a handful of times where I thought his anger was taken a little too far and it was, ultimately, not needed. Moreover, the illustrations which were done by Karl Kwasny, that were placed throughout the book added a nice visual dimension to the story. It would have been nice if there were more illustrations than the ones sparsely placed throughout the book. The illustrations helped me envision the characters and the settings, which helped me gain a deeper understanding of the story. Additionally, more illustrations would have also appealed to the young readers whom this book is geared towards. As I continued to read the story and tried to fall in love with the scary universe that Jason Segel painted, it just wasn’t quite there for me. Some may argue that perhaps due to the age range that this book is geared towards, I may have been a little too old to enjoy it. But there are books such as Harry Potter that bring to life a vivid and captivating universe that readers both young and old can enjoy and really get into. Jason Segel definitely could have taken the Netherworld a little bit further. Parts of the Netherworld were described in detail, which helped the nightmares come to life, but it wasn’t 100% there for me. Though I can see where Jason Segel and Kirsten Miller were attempting to get to, the story wasn’t as vivid or spooky as I thought it was going to be. I was hoping for a little bit more imagination, or character descriptions and plot points that would jump out of the page, more so than what was executed. But I really enjoyed the different, dynamic personalities that Charlie’s brother and friends have. They were the ones that stole the show and kept me intrigued. Also, it isn’t common for me to gravitate to supporting characters more so than the main character, so this reasoning was a little bit surprising. Though I felt like I was dragging my feet a little as I read the book, it really picked up towards the end where Charlie’s friends had to face their particular set of fears at the Netherworld’s version of their school. The story definitely amped up the level of action to the point where I found myself rooting for the characters to conquer and overcome their fears. Lastly, what struck a chord with me was Charlie’s biggest fear. Throughout his time in the Netherworld, Charlie’s nightmare friends were hinting that despite his epic adventure thus far, he had his major fear left to face. As they were building anticipation, my mind was racing, thinking it may be a clown, ghost, a huge spider or worse. But no, it was an emotional tie that hasn’t been let go yet and that fear was letting go of his mom. Charlie was doing all he could to hold on to what was left of his mother, the memories he had with her and clinging on to the last bits of her presence. But meeting with her spirit in the Netherworld, she reminded him that it was time to let her go. She wanted him and the rest of the family to move on and be happy. So, as Charlie faced his greatest fear, he said goodbye to his mother once and for all. Overall, Nightmares! was very underwhelming. I didn’t get as much spooks and thrills that I thought I was going to get. I thought the story and the setting could have been taken to a whole new level. However, since this is a trilogy, I understand that the first books are mainly used to lay out the groundwork that the future books will develop more and play off of. Next ArticleTV Review: Conviction 1×01 "Pilot"